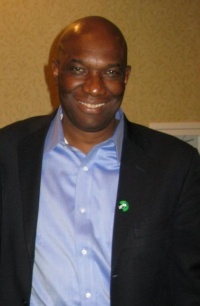 Gerry Hudson has served as the Executive Vice President of the Service Employees International Union since June, 2004. He joined the union in 1978, at which time he was working at a retirement home in New York, becoming Executive Vice President of the New York chapter in 1989. He serves on the board of the Apollo Alliance. In 1998 Hudson was a founder of the Communist-controlled organization, the Black Radical Congress. On April 6, 2010, Hudson spoke in a panel entitled "Labor, the Left and Progressives in the Obama Era" which was held at Georgetown University, alongside Chris Hayes, Harold Meyerson, Liz Shuler, Gerry Hudson, Michael Kazin, Joseph McCartin and Barbara Ehrenreich. During the panel, Hudson shared his thoughts on immigration, stating: "...On white workers, I think we got some real problems... I have heard some of the most anti-immigrant sentiments around... and this is where you get the black workers first, it's so f**king rabidly racist, til black people get scared..."